The English and Welsh are also known as British people (also referred to as the British, Britons, or informally as Brits or Britishers) and are citizens or subjects of the United Kingdom, Crown Dependencies, British overseas territories, and their descendants. Photo: Diana, Princess of Wales in the Yellow Oval room of the White House. By White House photographer [Public domain], via Wikimedia Commons. Princess Diana was the former wife of Prince Charles of Wales. In 1997, the world was in tears after learning that the people’s princess was killed during a car crash in Paris, France. 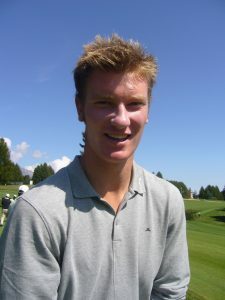 Photo: English professional golfer Chris Wood is from Bristol. Wikimedia Commons. England/ Wales are both part on the island of Great Britain and belong to the United Kingdom. Wales occupies the western part of the island. Both England and Wales were home to the ancient Celtic Britons as early as the Iron Age and have a much-studied “bedrock” genetics before the Celtic migrations. After the Celts, the island was invaded and occupied in succession by Romans, Angles, Saxons, Jutes, Danes, Norse, Normans and others. The English identity dates back to the early medieval times when they were known as Angelcynn (an Old English term). Today, the English language is the most widely learned second language in the world. British represent 298 unrelated British individuals who were sampled by European and American Universities. Source publication: British population data from Genetic Testing Laboratories, Las Cruces, NM.